NAIROBI, Kenya, Apr 20 – Members of Parliament have passed a Bill that will allow them to be paid Sh3.72 million each as gratuity at the end of the term of the 10th Parliament. Finance Minister Robinson Githae hurriedly moved the amendment on Thursday evening before MPs approved the Finance Bill. The new clause proposes that MPs get 30 percent of their annual income as gratuity. The amendment was passed almost unanimously with only nominated MP Millie Odhiambo opposing it claiming that it was unfair to the taxpayer. “I wish to oppose. This is because whereas I believe Members of Parliament are entitled, I will not be party to unfairness to this country. Members of Parliament have refused to reduce interest rates for members of the public, but when it comes to our own things, we are very quick and sneaky. I oppose the amendment;” she told the House after the she earlier supported the amendment to cap interest rates. 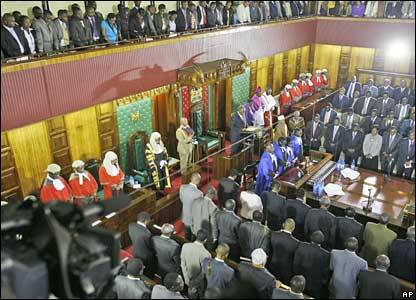 Analysts say the deal was a trade off between MPs and Githae to pass the contentious Finance Bill. The deal is said to have been struck during a lunch organized by Githae before the MPs came to the house for the Thursday session. MPs currently get Sh300,000 per annum on a flat rate so in 5 years were expected to receive they S 1.5 million upon the expiry of their term. Last year MPs defied attempts by the president and the prime minister and refused to pass the Finance Bill which without amendments to control bank interest rates and cost of fuel. On Thursday night, MPS also failed to pass an amendment proposed by Gem MP Jakoyo Midiwo to cap the maximum interest rate that a bank or a financial institution may charge for a loan or monetary advance. Lawmakers had wanted it not exceed more than four per centum, the rate set and published by the Monetary Policy Committee established under section 4D of the Central Bank of Kenya Act. Among those who opposed the amendment were Dujis MP Aden Duale who said that capping interest rates was very populist but and could only work if Kenya was a communist country. He said that the amendment was very simplistic in view of the structural drivers of interest rates in the market where he said that both the private and public sector ought to play a very crucial role in the regulation of interest rates. “It cannot work in this country. It cannot work in a country where there is a free market. I want to raise fundamental issues we want to control both the cost and the revenue. That is the worst form of price control,” said Duale in his contribution. Among those who supported the amendment were MPs Martin Ogindo of Rangwe, Gwassi’s John Mbadi, Mille and Rachael Shebesh. A total of 58 MPs voted against the amendment that was only supported by 17 MPs. This entry was posted on April 20, 2012 at 1:58 PM	and is filed under Kenya. You can follow any responses to this entry through the RSS 2.0 feed. Both comments and pings are currently closed. What else do you expect….Kenya’s a man eat man society and/or man eat nothing society. We put these greedy fellows in office to take care of our interests yet theirs come first. What a shame! Most of them know that they will be voted off. In other words, we gave them jobs and we are going to fire them come the elections, thus the need to hedge themselves. I believe when someone is fired, they do not get any benefits. Time for us as Kenyans to speak up against such greed. Will these ever change?.No money for Doctors, Nurses Teachers all who offer essential services, unlike bribe taking MP’s.This is a shame!!. All these politicians are a waste of the kenyan peoples hard earned taxed payers time and money and the entire nations resources. I am so happy for them.. they work so hard. let’s give them 90% bonus. Dimwits! I find it amazing how virtually the same people who complain are the same people who voted the person into office. For example,all i’m reading in articles and opinions is how people are in an uproar over the Mps decision to get Sh 3.72 million each as gratuity. And, yes this virtually cripples the people who’re struggling, cripples the poor, hurts education,health care services and help the rich get richer. Ahh, haven’t we seen this before under Moi and Kenyatta administrations? All i have to say to voters all over Kenya and diaspora is…WAKE UP! You put these people in the office, where they put back in place policies that many people are against. Kenya is not a man-eat-man society nor a man-eat nothing society. Caution and warning to voters…what you vote for is what you’re going to get, especially in the Presidential election coming up early next year. Yaani no wonder everyone wants to be an MP in Kenya! who gives these guys the guts to keep robbing us? what of the nurses and teachers who take care of the people! hopefully in this days of information flow all these guys will be unemployed come march 2013! let us vote for people who are willing and ready to be public servants not grabbers and thieves! !